Ask anyone about meetings and you get a similar response. “Waste of time.” “They get in the way of real work.” “Too many meetings.” For most people, they represent the time sink that produces very little. I’m stunned by how even the most seasoned executives, with years of experience leading meetings, see them as nothing more than a forum for information sharing, status updates and data dumps. Here’s a secret — they don’t have to be that way. As a matter of fact, you can use them to get real work done. Meetings are an opportunity for interaction. They are a place to discuss issues, share ideas, and gather information that can guide decision making. However, they usually include very little of this. There are many reasons for this including a lack of a clear objective for the meeting, no agenda, not having the right people in the room, spending too much time reviewing what’s been done instead of focusing on what needs to be done. Why are we meeting? If the answer is to share updates, you most likely don’t need a meeting. Unless you need input from most of the meeting participants that impacts the ability to move an issue or imperative forward, find another way to share. Share updates via brief status reports on Box.net or Sharepoint. A good reason for a meeting is the need to discuss issues, debate a plan of action, gather input for decisions or finalize decisions. Who should be in the room? Who are the right participants? Do they have the perspective, responsibility and accountability for the issues and actions you’ll be discussing. How often do we need to have these conversations? There is no perfect number. In a rapidly growing dynamic company, it may be once a week. In a more mature firm with less change, maybe once a month or once a quarter. 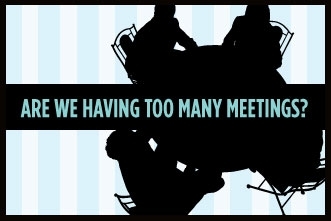 Too often meetings are scheduled more frequently than the content warrants. Do I have tools to use that will facilitate the conversation? Sometimes it’s just asking the right question. Sometimes it’s having a framework for analyzing the issue or guiding the conversation. The most basic tool — have an agenda that is shared with people before the meeting. Look at the meetings you are currently leading. How could they be better? Edith Onderick-Harvey is a highly regarded consultant, leadership and talent expert, and speaker. Edith is frequently quoted in the media including The New York Times, CNN.com, HR Executive, and American Executive. As the President of Factor In Talent, Edith works with leaders to take performance — their own, their team’s and their organization’s — to the next level. Making Room for Failure Talent Management Today: Is High Potential Passe?